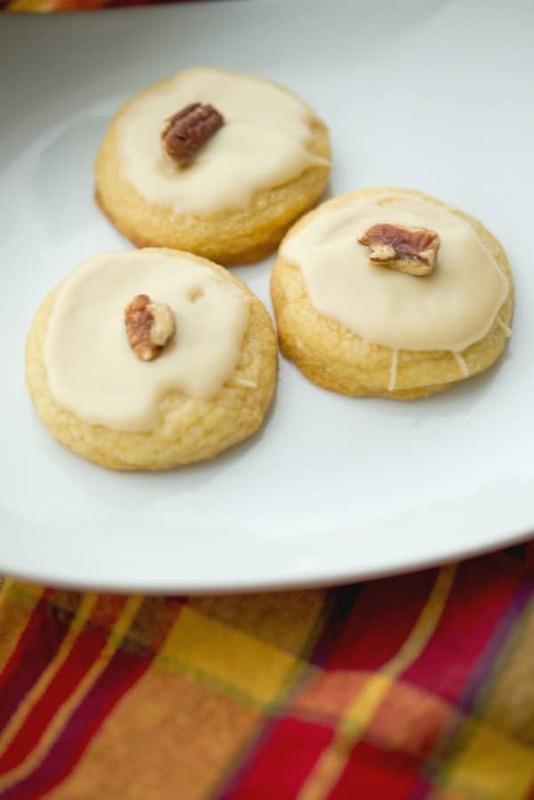 Soft and chewy in texture, these Maple Sugar Cookies coated with a maple syrup glaze and pecans are a must have Fall treat. I have to say that if given the choice, I prefer eating a sugar cookie over chocolate chip any day of the week. 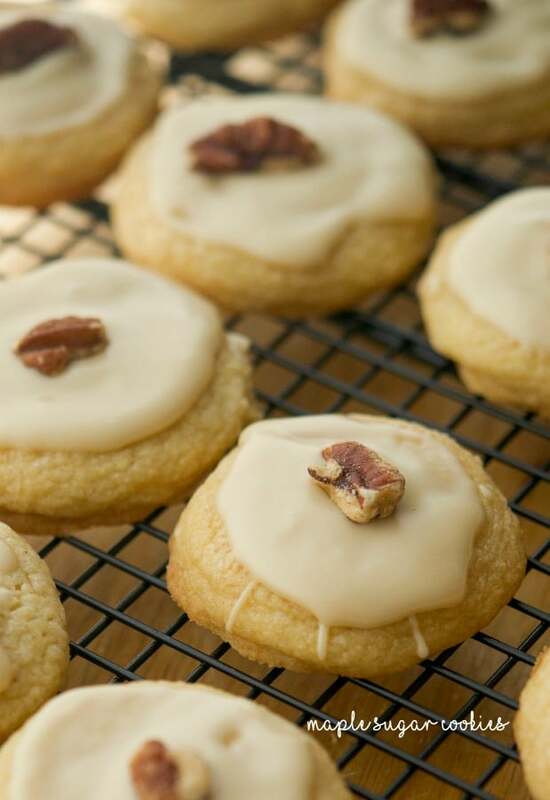 Don’t get me wrong, I do love chocolate every now and then, but I prefer the sweet, subtle taste of a sugar cookie; especially when they’re soft and chewy so I like to tweak my standard recipe and come up with new flavors, like these Maple Sugar Cookies. 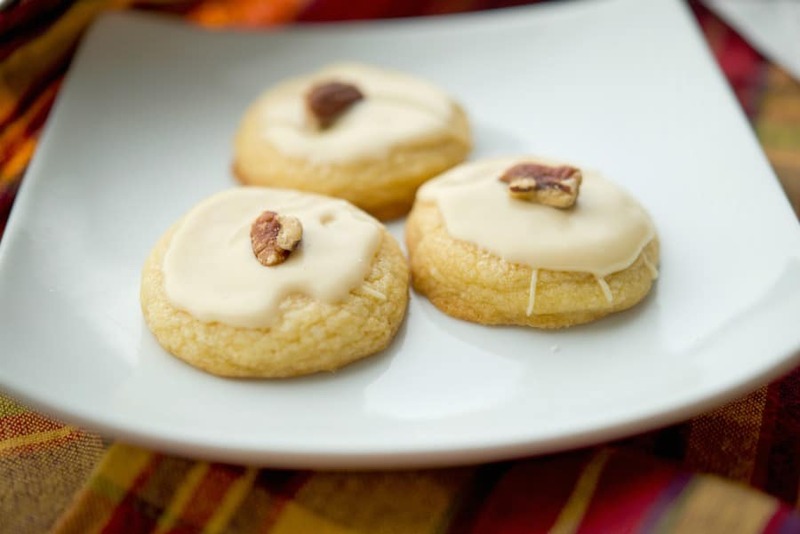 I’ve been playing around with my sugar cookie recipe to find a new one to make for Thanksgiving. 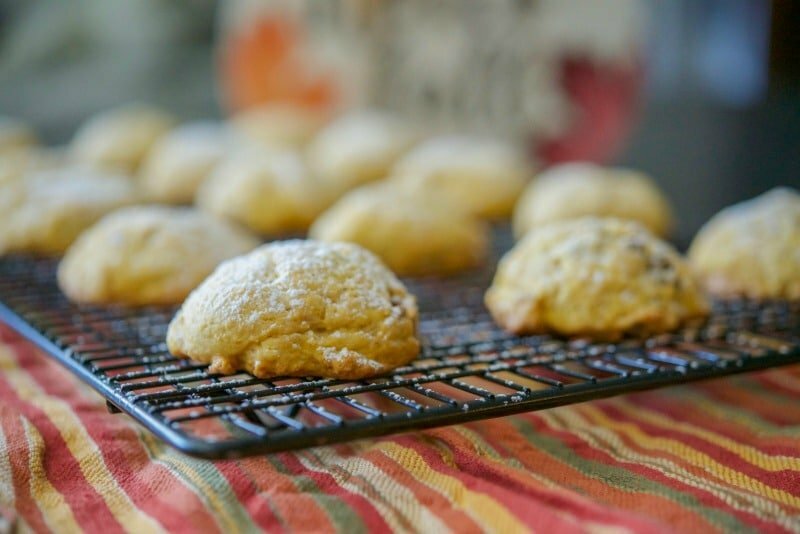 I first thought of adding pumpkin to the recipe and recently made these Pumpkin Pecan Sugar Cookies. They were delicious and my family devoured them so quick I hardly had any myself, but I wanted to try a new flavor besides pumpkin so I decided to add maple syrup instead. Once cooked, they tasted great and had that slight maple flavor; however, they did look a little plain, so I made a glaze using maple syrup and confectioners sugar; then topped it with a pecan half to give it a little color. 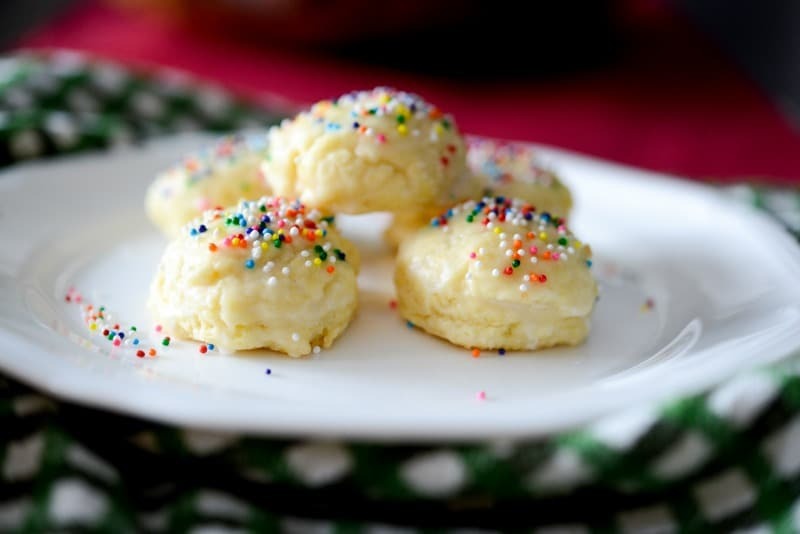 To make this recipe you’ll need softened butter (I used salted), confectioners sugar, egg, vanilla extract, maple syrup, all purpose flour, baking soda, and cream of tarter (which makes the cookies soft and chewy!). Combine the sugar, egg, vanilla and syrup in a bowl and mix until creamy; then add the dry ingredients and stir until all ingredients have been incorporated. Refrigerate for 30 minutes. Preheat your oven to 350 degrees F; then form 1” round balls with the dough and lay them on a baking sheet 2-inches apart; preferably nonstick that has been sprayed with cooking spray or one that has been lined with parchment paper or a silicone mat. Gently press down on the dough to flatten slightly and cook for 10-12 minutes. The cookies should be light brown around the edges and somewhat firm on the top. Remove from the oven and allow to cool completely on a wire rack before glazing. Once ready to glaze, combine maple syrup and confectioners sugar and mix until smooth. 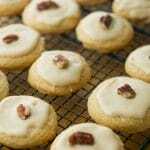 Using a small spoon, drizzle the glaze on top of the cookie and spread it around the top; then top with a pecan. Allow the glaze to harden completely before storing in an airtight container. These Maple Sugar Cookies were amazing and my daughter has already asked me to include these with our desserts for Thanksgiving. They weren’t overly sweet; which I liked, yet really satisfies your sweet craving. 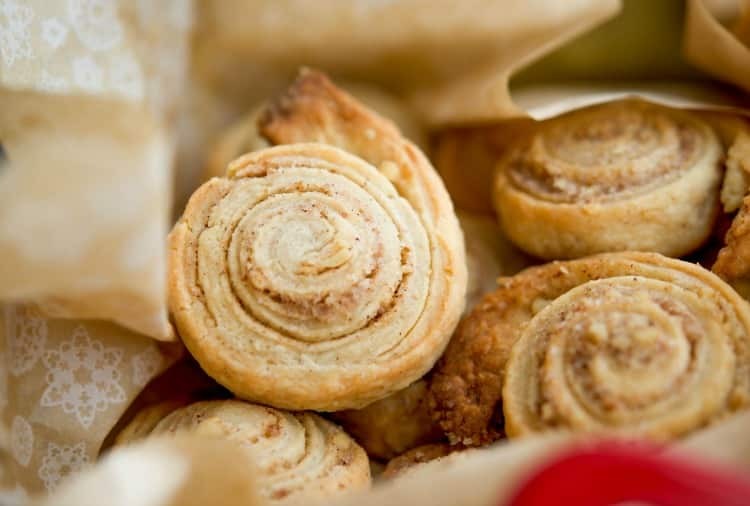 You can store these cookies in an airtight container at room temperature for up to one week or freeze them in a single layer in a resealable plastic bag for up to one month. ~Enjoy! Remove from the oven and allow to cool completely on a wire rack before glazing. 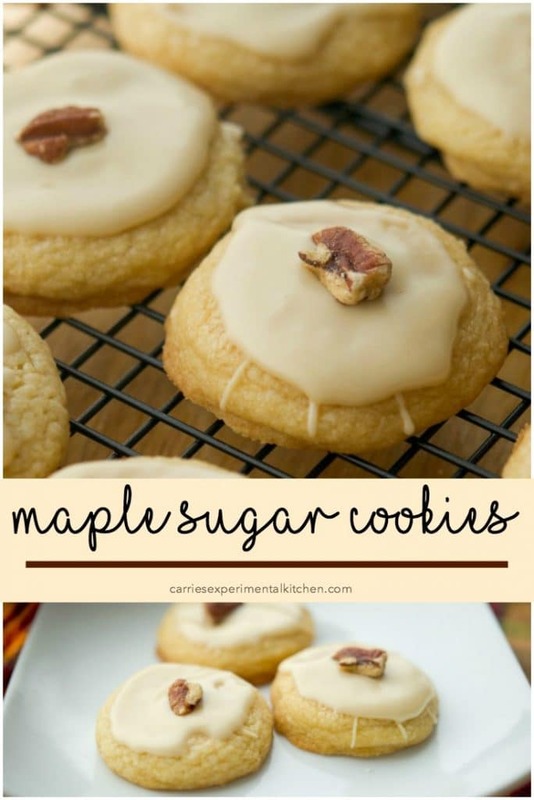 Combine the maple syrup and confectioners sugar in a bowl and mix until smooth. 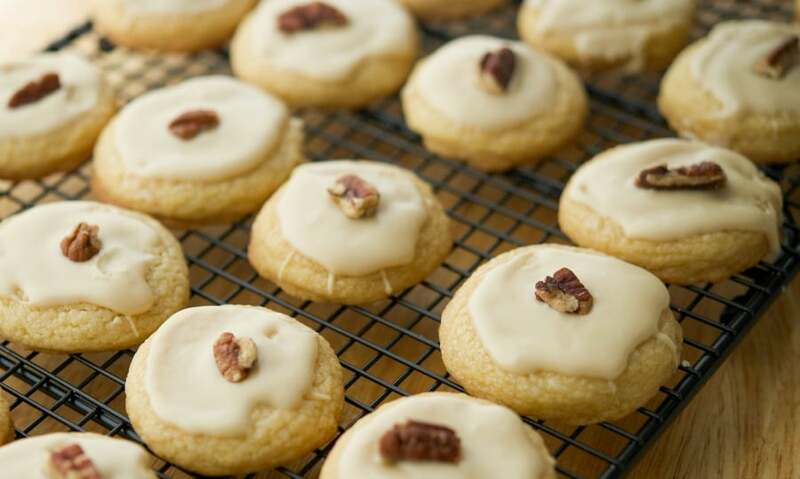 Using a small spoon, drizzle the glaze on top of the cookie and spread it around the top; then top with a pecan. Allow the glaze to completely before storing in an airtight container. 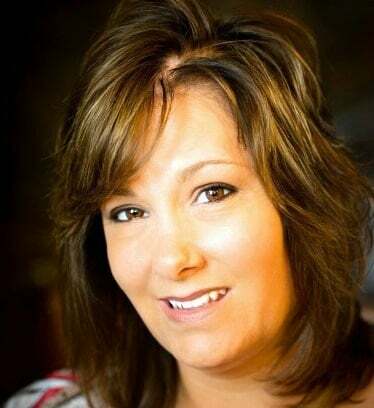 Visit the Dessert recipe section under the Recipe Index or find other favorites on my Desserts & Snacks Pinterest Board!